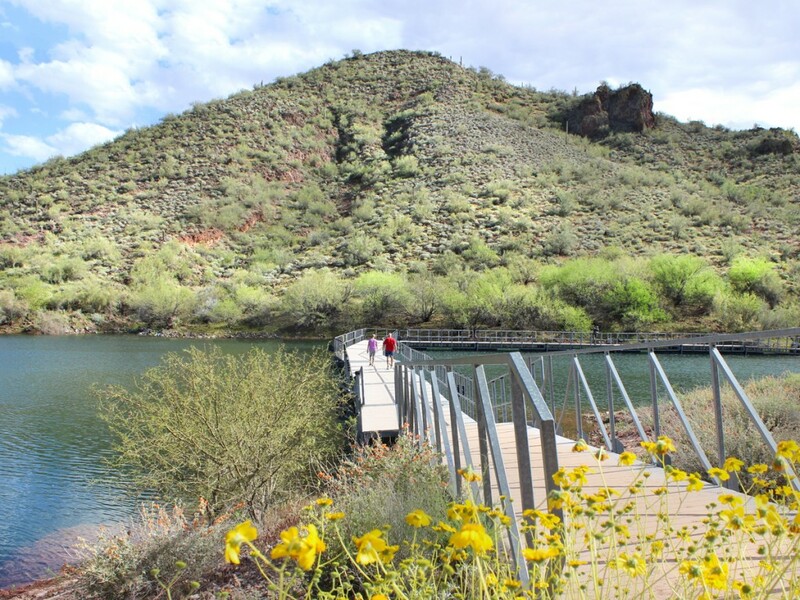 A floating bridge crosses crystal clear water, in one of Lake Pleasant’s intimate coves. The Pipeline Canyon Hiking Trail rambles along the sides of quiet lakefront hills to this hidden location. 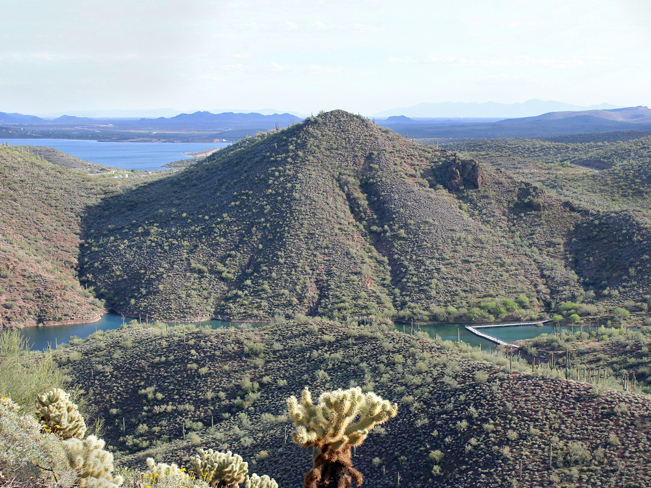 Far flung views set blue water against dry desert mountains. On a lucky day wild burros can be spotted. And ducks frolicking in water are commonplace. 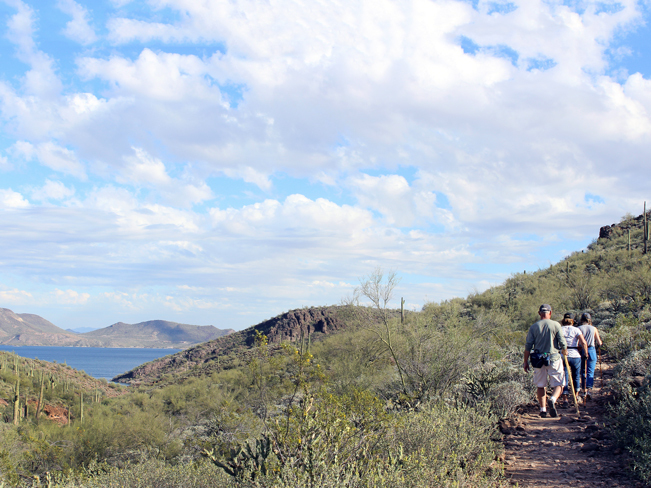 If your looking for a relatively short and easy hike to a special spot, this hike’s for you! 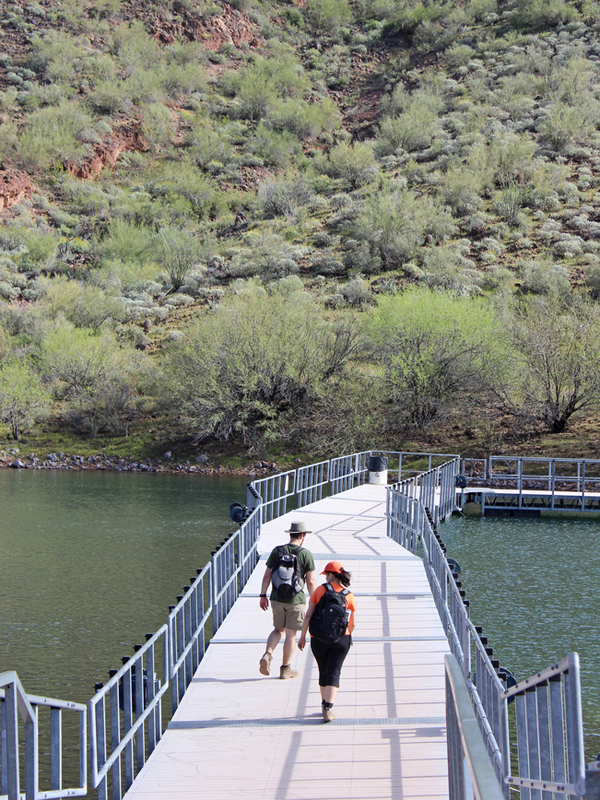 The Pipeline Canyon Hiking Trail is a favorite at Lake Pleasant, both for its short length and its extra-special floating bridge feature. Set on the west side of the lake, the Pipeline Canyon Hiking Trail winds along the hillsides to reach a quite cove, rife with wildlife, and an angled bridge across it. The hike can be started at either end: north (on Cottonwood Lane) or south (at North Park Road). 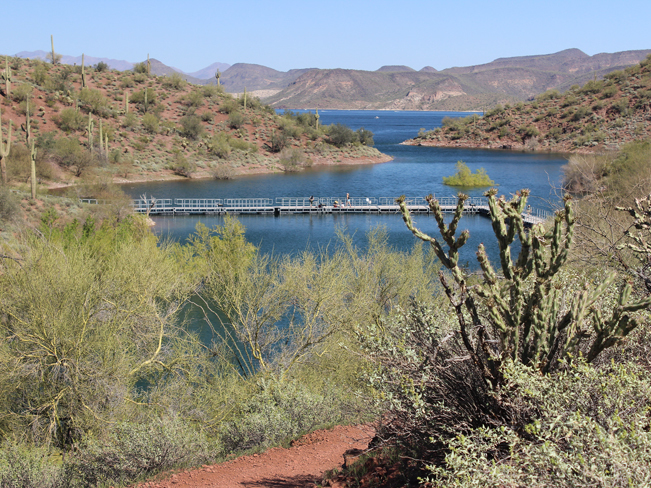 Either way is lovely, but the gorgeous-ist lake views are found in the hike from the north entry. Kicking off from the north trailhead, the path climbs modestly for a half mile, and then flattens out as it moves between the hills around the lake. At 1.5 miles the floating bridge comes into view, tucked into a lovely blue cove. It’s great fun to walk across. Suspended by multiple pontoons, and anchored to the lake floor, the bridge rises and falls with the lake. 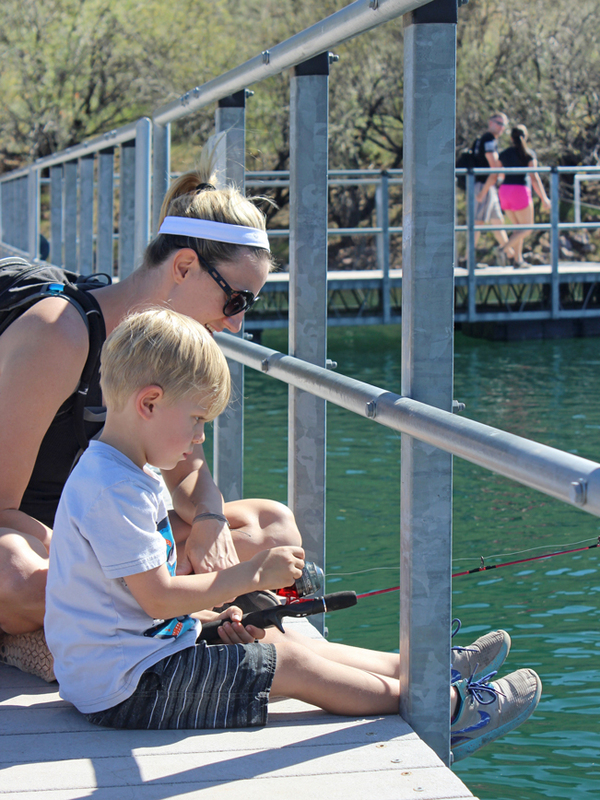 If you’re a fishing afficionado, be sure to bring your poles and some bait. There are fish to be had, and it’s an cool spot to hang out. Past the bridge, on the southern end of the Pipeline Canyon Hiking Trail, the path continues another half mile, slowly ascending the side of a hill, with the Aqua Fria River flowing below. There are picnic grounds with awesome lake views at the finish. Floating or Pontoon bridges were first used in ancient China in the 9th century BC! They are constructed by joining a series of floats together and attaching a deck on top. Click here to download a trail map. 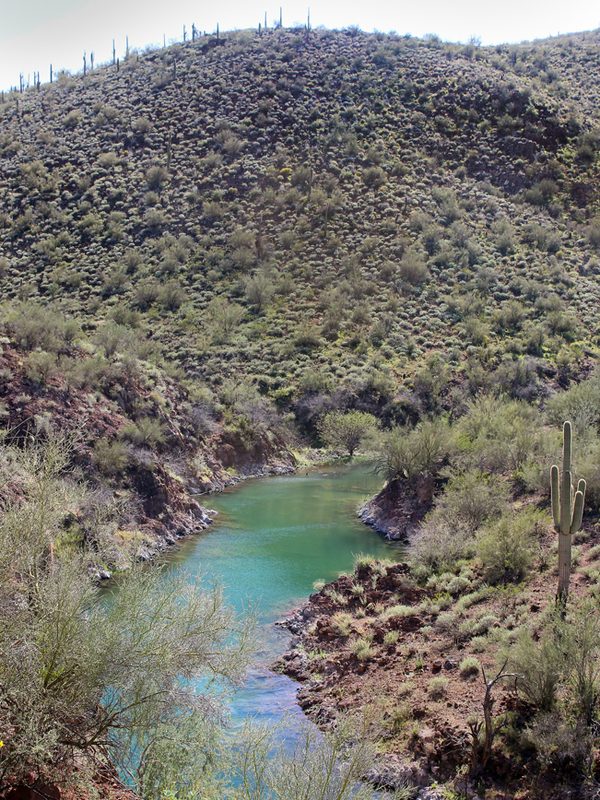 Directions From the intersection of I-17 and AZ-74 / Carefree Highway, (north of Phoenix), turn west / left onto Carefree Highway and drive for 11.26 miles to Castle Hot Springs Road. Turn north / right onto Castle Hot Springs Road and continue for 5.94 miles (past the entry gate to the lake) to Cottonwood Road. Turn south / right onto Cottonwood Road and drive for a quarter mile to the end, and the trailhead to the Pipeline Canyon Hiking Trail.